WASHINGTON (AP) — President Donald Trump’s first veto was more than a milestone. It signals a new era of ever perilous relations between the executive and legislative branches of government. Trump’s agenda was stymied even before his party lost unified control of Washington at the start of the year and he has grown increasingly frustrated by his dealings with Congress, believing little of substance will get done by the end of his first term and feeling just as pessimistic about the second, according to White House aides, campaign staffers and outside allies. Republicans in Congress are demonstrating new willingness to part ways with the president. On the Senate vote Thursday rejecting the president’s national emergency declaration to get border wall funding, 12 Republicans joined Democrats in voting against Trump. The 59-41 vote against Trump’s declaration was just the latest blow as tensions flare on multiple fronts. Trump tweeted one word after the vote: “VETO!” And he eagerly flexed that muscle on Friday for the first time, hoping to demonstrate resolve on fulfilling his 2016 campaign pledge. GOP senators had repeatedly agitated for compromise deals that would give them political cover to support Trump despite their concerns that he was improperly circumventing Congress. But the president was never convinced that any of the proposals ensured the resolution would be defeated, said a White House official who spoke on condition of anonymity to discuss internal thinking. A last-ditch trip to the White House by a group of senators Wednesday night only irritated Trump, who felt they were offering little in the way of new solutions. As the vote neared, Trump repeatedly made clear that it was about party fealty and border security and suggested that voting against him could be perilous. “It’s going to be a great election issue,” he predicted. Looking past the veto, Trump’s plans for future collaboration with Congress appear limited. With the exception of pushing for approval of his trade deal with Mexico and Canada, the president and his allies see little benefit for investing more political capital on Capitol Hill. Trump ran against Washington in 2016, and he is fully expected to do so again. 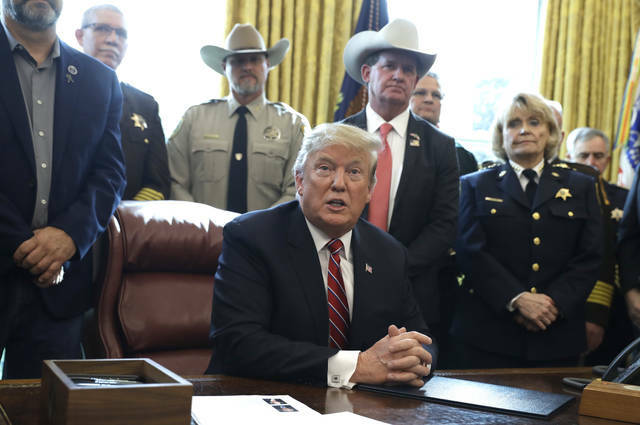 Trump once declared that “I alone can fix it.” But that was before getting hamstrung in Washington, and he is now exploring opportunities to pursue executive action to work around lawmakers, as he did with his emergency declaration on the border wall. He is directing aides to find other areas where he can act — or at least be perceived as acting — without Congress, including infrastructure and drug prices. His dealings with Congress were inconsistent even when Republicans controlled both chambers, and he has made few overtures to Democrats since they won control of the House. Trump initially predicted he could work across the aisle, but that sentiment cooled after the bitter government shutdown fight and in the face of mounting investigations. His frustrations are evidence of the difficulty that the Washington neophyte and former business executive has had with the process of lawmaking, and the challenges yet to come. The White House argues there are still opportunities for collaboration, listing ratification of the Canada-Mexico trade pact as a priority. But passage is anything but assured. Trump’s ire has been directed at both parties for some time, aides said. He was upset with the Republicans’ performance during the recent congressional hearing featuring his former lawyer, Michael Cohen, telling allies that he was not impressed with their questioning. Trump’s budget proposal this past week was viewed as a shot at Democrats, with its proposals to increase money for the border wall and cut to social safety net programs. The plan, which had little in the way of new or bipartisan ideas, was declared dead on arrival by Democratic House leaders. Further stoking tensions, House Speaker Nancy Pelosi, D-Calif., invited NATO Secretary-General Jens Stoltenberg to address an upcoming joint meeting of Congress, in what was widely seen as a rebuke of Trump’s criticism of the trans-Atlantic alliance. The invitation was backed by Senate Majority Leader Mitch McConnell, R-Ky., and followed votes earlier this year in which Republicans voiced opposition to Trump’s plans to draw down U.S. troops in Syria and Afghanistan. Presidential complaints about Congress — and efforts to find a workaround — are nothing new. President Barack Obama in 2014 resorted to what became known as his “pen and phone” strategy. 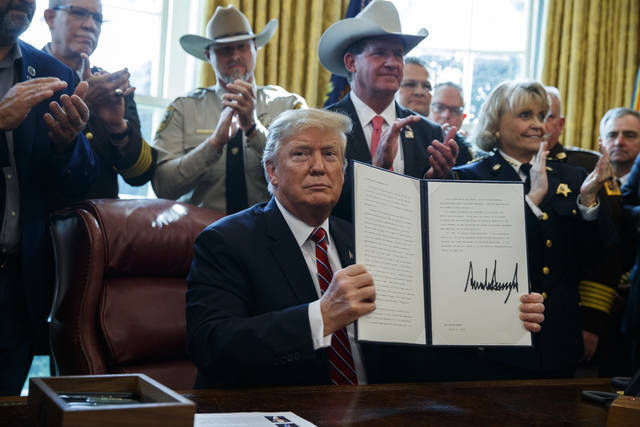 “I’ve got a pen to take executive actions where Congress won’t, and I’ve got a telephone to rally folks around the country on this mission,” he said. Obama’s strategy yielded years of executive orders and regulatory action, but many proved ephemeral when Trump took office and started unwinding them. You probably have heard the puzzler. Which is safer: a one-engine aircraft, or a two-engine aircraft? There follows a clarifying question: Can the two-engine aircraft fly on one engine? If not, then the two-engine aircraft has twice the probability of a crippling failure of one engine, and so it is definitely not safer. The president’s new budget takes this puzzler two steps further: It is a four-engine aircraft that cannot fly on three. And each of those engines has a history of failure. Unlike many recent budgets (including the one two years ago) that promised (in vain) to balance in 10 years, this one takes 15 years. And over that record-long flight, it assumes year after year of unprecedented action and good news on four different fronts. Failure on any one could send the already excessive deficit up instead of down. First, the budget assumes an extraordinary long run of rapid economic growth — about half again as fast as since the start of the financial crisis — which is also the start of the retirement of the baby-boom generation, and the start of a period of slower labor-force growth that will continue for decades. The economy is doing well today, but not well enough to improve the budget. Tax revenue fell after the 2017 tax cuts, and the deficit rose. The new budget calls for even more tax cuts, and assumes more than a decade of faster growth than today to close the budget gap. This would be all the more remarkable as the baby boomers continue to retire, and labor force growth continues to slow to near zero. The budget will hit its numbers only if the rate of productivity growth more than doubles over its long-term average. Productivity is notoriously difficult to increase by one-tenth of a percentage point, much less the more than one full percentage point that the budget assumes. Second, the public debt is already unprecedentedly high (for periods other than World War II) and is rising rapidly. If interest rates rise, the interest on the debt will skyrocket. The budget assumes that interest rates will remain low, which is unlikely if the economy grows as fast as the budget also assumes. The budget proposes to squeeze annual non-defense appropriations down to their lowest level (as a percentage of our nation’s GDP) on record in just one year, and then to cut it more than in half in just nine more years. Think of non-defense appropriations as the necessary overhead — highways, airports, transit, water and sewer, science, education, the administration of justice — that our economy and society need. Can we bet the mortgage on cutting such investment below the historical minimum by half — when the Congress majority could not pass appropriations bills as low as the president’s requested levels the last two years? And the budget assumes big savings from health care — particularly Medicare and Medicaid, and from repealing “Obamacare.” Much of this money is presumed to come from prescription drug savings, and turning care for low-income people over to the states — which have their own budget problems. Such savings have often been proposed (including in the last two years), but have never been achieved. What are the chances that the pressure on care for our seniors (including the indigent in nursing homes) will prevent such cuts? This budget is essentially the same that has been espoused by former Representative Paul Ryan, R-Wisconsin. For the last two years, this president had Ryan as the speaker of the House with a large congressional majority. He proposed essentially the same — Ryan’s — budget. He got nowhere. Almost 40 years ago, under much less dangerous budgetary circumstances, President Ronald Reagan proposed a similar budget. Then-Senate Majority Leader Howard Baker called it a “riverboat gamble.” Over the next 12 years, the nation’s public debt quadrupled — thereby doubling relative to the size of our economy. Advocates of such a budget strategy today need to consider whether the nation should place such a wager on an airplane instead of a riverboat. Perhaps prudent saving, rather than gambling, is in order. Joseph J. Minarik is senior vice president and director of research at the Committee for Economic Development. He served as chief economist at the Office of Management and Budget for eight years under President Clinton. He wrote this for InsideSources.com. Disclosure statement: Christina Leza does not work for, consult, own shares in or receive funding from any company or organization that would benefit from this article, and has disclosed no relevant affiliations beyond their academic appointment. Partners: Colorado College provides funding as a member of The Conversation US. Immigration restrictions were making life difficult for Native Americans who live along – and across – the U.S.-Mexico border even before President Donald Trump declared a national emergency to build his border wall. The traditional homelands of 36 federally recognized tribes – including the Kumeyaay, Pai, Cocopah, O’odham, Yaqui, Apache and Kickapoo peoples – were split in two by the 1848 Treaty of Guadalupe Hidalgo and 1853 Gadsden Purchase, which carved modern-day California, Arizona, New Mexico and Texas out of northern Mexico. Today, tens of thousands of people belonging to U.S. Native tribes live in the Mexican states of Baja California, Sonora, Coahuila and Chihuahua, my research estimates. The Mexican government does not recognize indigenous peoples in Mexico as nations as the U.S. does, so there is no enrollment system there. Still, many Native people in Mexico routinely cross the U.S.-Mexico border to participate in cultural events, visit religious sites, attend burials, go to school or visit family. Like other “non-resident aliens,” they must pass through rigorous security checkpoints, where they are subject to interrogation, inspection and rejection or delay. Many Native Americans I’ve interviewed for anthropological research on indigenous activism call the U.S.-Mexico border “the imaginary line” – an invisible boundary created by colonial powers that claim sovereign indigenous territories as their own. A border wall would further separate Native peoples from friends, relatives and tribal resources that span the U.S.-Mexico border. Tribal members say that many Native Americans in the U.S. feel detached from their relatives in Mexico. The Tohono O’odham are among the U.S. federal tribes fighting the government’s efforts to beef up existing security with a border wall. In late January, the Tohono O’odham, Pascua Yaqui and National Congress of Indian Americans met to create a proposal for facilitating indigenous border crossing. The Tohono O’odham already know how life changes when traditional lands are physically partitioned. By U.S. law, enrolled Tohono O’odham members in Mexico are eligible to receive educational and medical services in Tohono O’odham lands in the U.S.
That has become difficult since 2006, when a steel vehicle barrier was built along most of the 62-mile stretch of U.S.-Mexico border that bisects the Tohono O’odham Nation. Previously, to get to the U.S. side of Tohono O’odham territory, many tribe members would simply drive across their land. Now, they must travel long distances to official ports of entry. One Tohono O’odham rancher told The New York Times in 2017 that he must travel several miles to draw water from a well 100 yards away from his home – but in Mexico. And Pacific Standard magazine reported in February 2019 that three Tohono O’odham villages in Sonora, Mexico, had been cut off from their nearest food supply, which was in the U.S.
Land is central to Native communities’ historic, spiritual and cultural identity. Several international agreements – including the United Nations Declaration on the Rights of Indigenous Peoples – confirm these communities’ innate rights to draw on cultural and natural resources across international borders. The United States offers few such protections. Officially, various federal laws and treaties affirm the rights of federally recognized tribes to cross between the U.S., Mexico and Canada. The Jay Treaty of 1794 grants indigenous peoples on the U.S.-Canada border the right to freely pass and repass the border. It also gives Canadian-born indigenous persons the right to live and work in the United States. The American Indian Religious Freedom Act of 1978 says that the U.S. will protect and preserve Native American religious rights, including “access to sacred sites” and “possession of sacred objects.” And the 1990 Native American Graves Protection and Repatriation Act protects Native American human remains, burial sites and sacred objects. United States law also requires that federally recognized sovereign tribal nations on the U.S.-Mexico border must be consulted in federal border enforcement planning. In practice, however, the free passage of Native people who live across both the United States’ northern or southern border is curtailed by strict identification laws. The United States requires anyone entering the country to present a passport or other U.S.-approved identification confirming their citizenship or authorization to enter. The Real ID Act of 2005 allows the Department of Homeland Security secretary to waive any U.S. law – including those protecting indigenous rights – that may impede border enforcement. Several standard U.S. tribal identification documents – including Form I-872 American Indian Card and enhanced tribal photo identification cards – are approved travel documents that enable Native Americans to enter the U.S. at land ports of entry. Only the American Indian Card, which is issued exclusively to members of the Kickapoo tribes, recognizes indigenous people’s right to cross the border regardless of citizenship. The majority of indigenous Mexicans wishing to live or work in the United States, however, must apply for immigrant residence and work authorization like any other person born outside of the U.S. The relevant tribal governments in the U.S. may also work with Customs and Border Patrol to waive certain travel document requirements on a case-by-case basis for short-term visits of Native members from Mexico. Since border patrol agents have expansive discretionary power to refuse or delay entries in the interest of national security, its officers sometimes make arbitrary requests to verify Native identity in these cases. Such tests, my research shows, have included asking people to speak their indigenous language or – if the person is crossing to participate in a Native ceremony – to perform a traditional song or dance. Those who refuse these requests may be denied entry. Border agents at both the Mexico and Canada borders have also reportedly mishandled or destroyed Native ceremonial or medicinal items they deem suspicious. “We’ve been here since time immemorial,” he added. 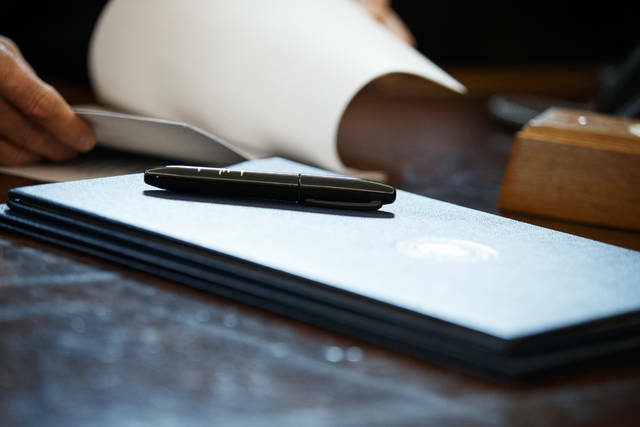 Two things can be said with certainty about Trump’s 2020 budget request: It is DOA, dead on arrival, in the House; and it is a political document, catering to his loyal supporters, rather than a serious fiscal statement. What the budget request reveals is that Trump, left to his own devices, would further skewer the middle class and low-income groups, downgrade diplomacy and environmental protection, give the military more than it really wants or needs, and fulfill his obsession with a border wall. To say the budget is revolting and immoral would be a vast understatement. But it may (and should) give Democrats additional evidence of Trump’s unfitness to lead. Below is a quick breakdown of the budget proposal. The Washington Post has a very good analysis March 13, 2019, at the source for the figures below. —Reductions to the federal student loan programs that total $207 billion in the next 10 years and include eliminating Public Service Loan Forgiveness and subsidized student loans. WASHINGTON (AP) — Bill Shine, a former Fox News executive who took over as President Donald Trump’s communications director last summer, exited the White House on Friday, the latest person to step away from a job that has become a revolving door within the turbulent West Wing. Shine will join the president’s Republican re-election campaign, the White House said in a laudatory statement that quoted Trump and other top White House officials. When Shine joined the administration, he was viewed as an experienced hand whose television experience could help shape Trump’s message. But like others before him, Shine was forced to grapple with a president who preferred to run his own communications strategy via tweet. In recent weeks, Trump had expressed frustration that Shine had not done more to improve his press coverage, said two people close to the president who were not authorized to speak publicly and spoke to The Associated Press on condition of anonymity. The announcement took many in the West Wing by surprise, though there were signs of unrest lately. Shine did not join Trump on his high-stakes trip to Vietnam for a summit with North Korea’s Kim Jong Un. Shine was Sean Hannity’s top producer for several years at Fox News Channel, rising to network leadership when founding chief executive Roger Ailes was forced out following sexual misconduct allegations. Shine wasn’t accused of such misdeeds, but he was named in lawsuits as someone who tried to keep a lid on allegations of bad workplace behavior instead of trying to root it out. He was known as Ailes’ operations man and enforcer, the one who tried to put his boss’ directives into action. Shine’s work at Fox, and the close relationship the network has with the Trump White House, was given new attention this week through a lengthy story in The New Yorker magazine. That article led to the Democratic National Committee saying it would not partner with Fox on any debates involving 2020 presidential contenders. Shine succeeded Hope Hicks as communications director. Others who served in that role were Anthony Scaramucci, who lasted just 11 days, Sean Spicer and Mike Dubke. Associated Press writers Jonathan Lemire and David Bauder in New York and Catherine Lucey in Washington contributed to this report.